Our vet clinic offers your pets first class care, tailored treatment options and a calm, relaxing environment. Our expert staff, combined with our state-of-the-art facility will get the best outcome for your pet every time. If you live in Thornbury and need a veterinarian, look no further than nOah. A unique aspect of our veterinary clinic near Thornbury is the fact that we have separate wings of the hospital that are devoted entirely to either cats or dogs. We’ve done this to ensure that both dogs and cats feel completely comfortable during their visit and so we can tailor each environment to the unique needs of dogs and cats. There are plenty of treats for dogs to enjoy in the dog waiting area while they wait for their appointment. And our animal devoted vet nurses can never resist a cuddle. The cat waiting area features seating that allows you to place your cat carrier underneath your seat to give your cat complete privacy as well as the inclusion of Feliway diffusers that emit calming pheromones. 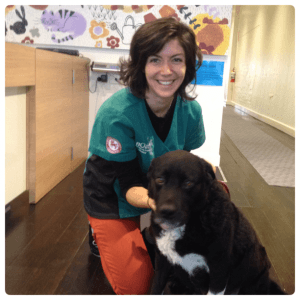 Our holistic veterinary approach is unique to the Thornbury area and it’s something your pets will appreciate. Calm pets are far easier to examine and treat, the less time we have to spend calming your pet down the more time we can spend ensuring that they’re enjoying full health. Whether its for a general check-up or an operation, your pet will be in fantastic hands at nOah. Dog Vaccinations: To give your dog the best possible chance of enjoying a healthy life you need to make sure their injections are up to date. We make this easy by sending you reminders and providing your dog with a welcoming environment each time they need a shot. Cat Vaccinations: If you want to cat to be the perfect couch mate and companion for the long haul, they need their vaccinations. With our state-of-the-art facilities and caring team, there’s no better place for your cat or kitten to have their vaccinations than nOah. And being just down the road from Thornbury, your feline friend will appreciate the short distance. General / Routine check-ups: Routine check-ups are the key to a long life for your pet. So, why not take your pets somewhere they will enjoy—visit our caring, compassionate veterinarian next time your pet needs a check up. Dental Care: Our free dental health checkups will keep your pets oral health tip top and contribute to keeping their overall health in peak condition. Behavioural Consultations: Don’t despair if your dog has decided that chewing up your shoes is his favorite activity. Or your cat’s urinating habits have spread beyond the litter tray. Bring them along to us and we’ll help save your belongings, as well as your relationship with your pet. Cat Boarding: If you’re jetting off on holiday, you need peace of mind that you’re leaving your cat somewhere you can trust. Our facilities are top-class and our team is caring and compassionate. Your cat will love its stay with us. And so close to Thornbury too, getting them here will be a breeze. Puppy School: Puppy school turns pets into friends. Our positive training methods will give you a well-behaved dog that respects and loves, rather than fears you.